Thanksgiving Day. One of the three best days of the year. 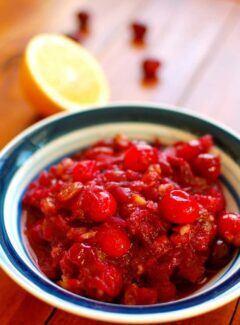 Time for some red wine cranberry sauce. This is much like the cranberry zinfandel conserve I posted a couple years ago with a few twists. 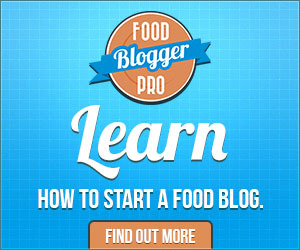 I thought I should update that post since it was before the printable recipe and before DSLR camera. Both recipes are sure to please though. Take your pick or mix up the two, you’ll end up with a good sauce. 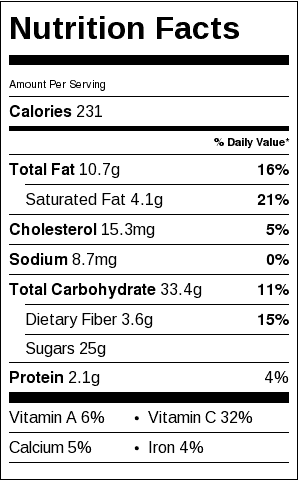 I tried another cranberry sauce recipe a few days ago and it was just full of sugar…like the recipe called for 2 1/2 cups of sugar. I only used 2 cups but that was way too much. I prefer a less sugary, tart sauce. 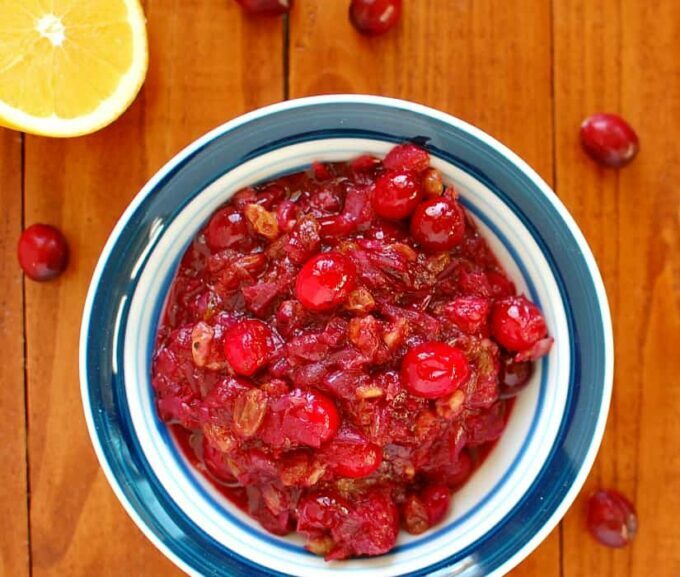 The tartness of cranberries goes perfectly with turkey. One of the additions to this new sauce recipe is pieces of orange and orange zest. It adds a nice flavor to the sauce. I also used maple syrup rather than regular granulated sugar. I think this was in protest to the other sweet recipe I tried. Ha! Finally, I used walnuts instead of hazelnuts. Hazelnuts are tasty but they are generally pretty expensive. Anyway, MaryJo always has walnuts and pecans on hand, so I just chose the walnuts. 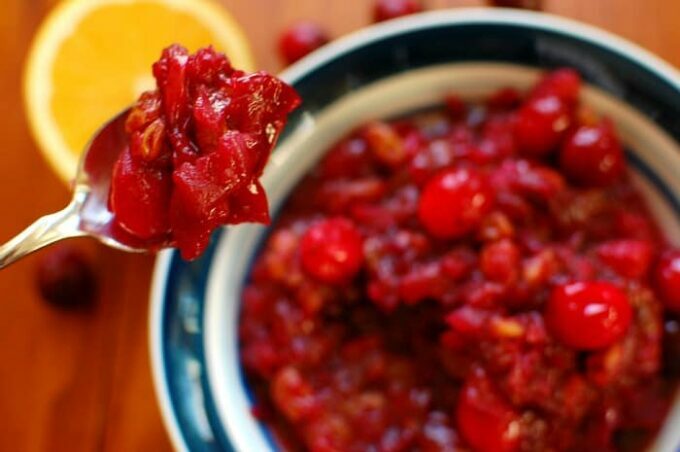 Have a great Thanksgiving and by all means, make your own red wine cranberry sauce. 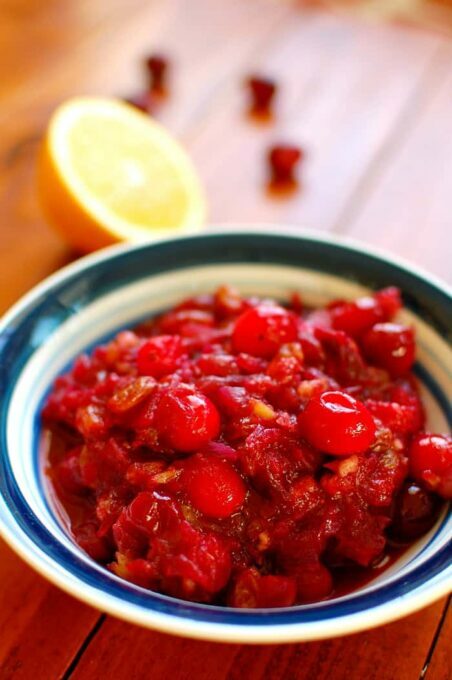 In a dutch oven or large sauce pan, place cranberries, raisins, orange, zest, wine and apple pie spice and cook on medium high for 5 or 6 minutes while occasionally stirring. Add the cooked onion, salt and maple syrup and continue to cook for 10 minutes and the sauce thickens. Remove from heat and stir in chopped walnuts.